Part four of our meeting agenda template series focuses on project management meetings. Project managers: you know and love these meetings for keeping you on task and organized. But what should be on the meeting agenda to keep your meeting on track? Here are five essentials for your next project management meeting agenda. Click here to jump to a SoapBox project management meeting agenda template! Don’t confuse this “update” with everyone rattling off what they’ve done in the week. Focus on what didn’t get done, why and what the impact is on the project. Working on a team, no one will ever collectively complete everything on time always. Things come up. This is your opportunity to make sure everyone’s priorities and tasks are in line. Segue into what roadblocks and risks are forecasted. Focus on short term (what might happen in the week) and long-term (what might happen in a month, or two months from now). This is your biggest opportunity to solve problems and eliminate obstacles. Here’s where you can press into important dates coming up, whether it be an upcoming presentation, a beta launch, etc. Make sure everyone in the team knows of the important dates. Pro tip: Add dates to a shared calendar (yes, in addition to your PM tool!). This item won’t be relevant to every team member and every project, but it might be relevant to spend some time talking about where you are in your budgeting. Are you over or under and what needs to be prioritized to stay in line? Project management meetings are notorious for running over. Keep your team in check by protecting their (and your!) time. Assign a time-keeper at the beginning of the meeting, and ensure that everyone knows the estimated time for each agenda item. If you don’t make decisions, did the meeting really happen? For each agenda item, be sure to summarize any key decisions that were made and assign action items that need to get done. Notes are so crucial in these types of meetings. At the end of your project, you want to be able to have a clear retrospective meeting on results, what went well and what didn’t go well. They’ll go so far in keeping everyone on the same page and tracking progress over time increasing accountability. Give everyone access to the meeting notes and encourage people to contribute to them. Keeping your notes in one central place that everyone can access will also avoid the meeting notes email dance and losing them in the email vortex. Pro tip: We built an app for that! Check out our meeting minutes feature. 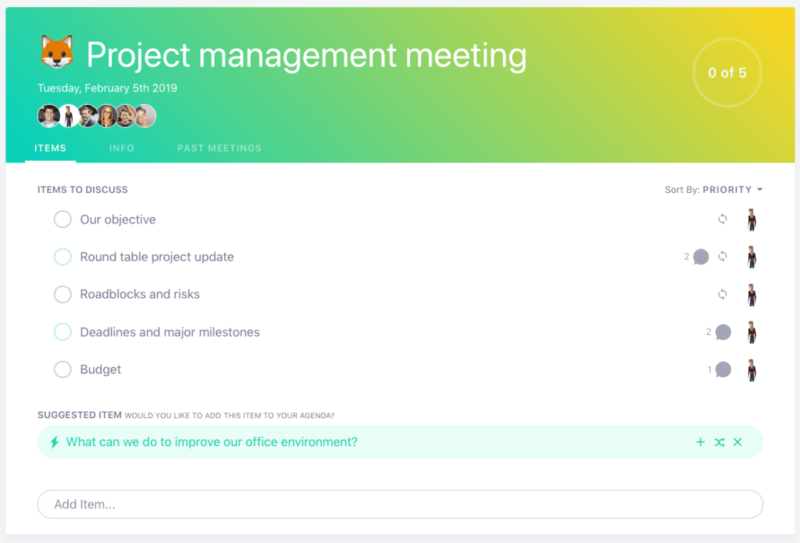 Whatever task management or project management tool you use (we’re big Asana and JIRA users at SoapBox), add in your updates and new items right away. You can even carve out time in the last 10 minutes of the meeting to get your house in order in your PM tool. This really goes for all meetings, but be ruthless about keeping your project management meetings focused. If conversations start to go off the rails, reiterate the meeting objective – if the conversation doesn’t pertain, then either shut it down or take it offline. Make sure you have everyone you need in the room (or dialed in for remote team members!). If a key person in your project can’t make the meeting, don’t push on and have a less valuable meeting because of it. Reschedule and maximize everyone’s time by having all of the right people in the room.